I will be posting new work in my etsy shop all weekend. Please go check it out. I am editing a few images. Mostly of work from my firing last week. Here are a few images of pieces that are in my show at Willits Center for the Arts. I was getting a little antsy to do something while I was bisquing work for my next firing so I though I would do some testing. It had been a while since I had done any tiraxial or quadraxial blends. I was hoping to find a new glaze or wash that would give nice magnesium matte surfaces but be a little runny. Instead I found some very stable glazes and lots of nice surfaces that I would consider testing more in the future. I thought a lot of these were nice enough to share and also wanted to share a little bit of the note taking that goes into each batch of test tiles. I try to photograph and take notes on every tile that I test. This includes a accurate photograph of the tile and notes that would tell me what the tile looks like without the photo. I think its important to be able to be articulate about the surfaces that we are looking at and communicate clearly enough to accurately discribe all of the intricacies that might be lost in the photograph. I am also including two photographs to demonstrate how the lighting and background are important to how we interpret the glaze itself. The clay bodies here are from Laguna they are Amadore (the darker of the two) and Half and Half (the lighter of the two). 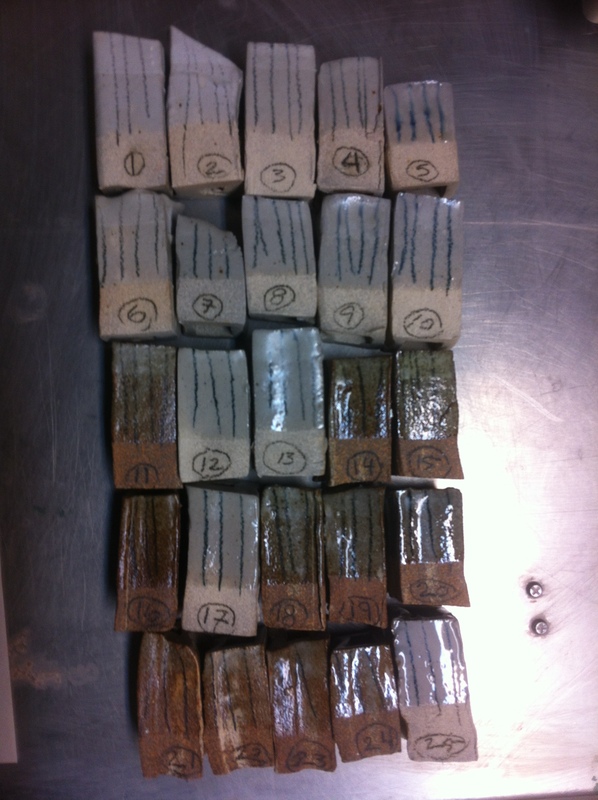 These tiles were extruded without cleaning the extruder between claybodies. The firing was gas reduction with first reduction started at cone 010 through 04 and then light back pressure maintained up through cone 9. The kiln was fired to a soft cone 10 and the damper opened for a minute at the end before the kiln was shut off. Very dry white, stony, moderately transparent. Very stable and breaks around corners and edges well. Would make a nice sculptural surface. Feels like a 300 grit sandpaper. Also very stoney dry white glaze that shows all application flaws. Very stable and even has some cracking in the crevices. Will be good for sculpture as well. Satin glaze with moderate translucency. Very stable but thick application may cause matteness. Altering feldspar content may make it more reliable and even. Semi-gloss clear on first dip and satin on second dip. Very stable and moderate transparency. Very glossy clear glaze with some magnesium crystal formation causing some opaque areas. Looks like it could run if thick. Pools and breaks nice and evenly over textures. 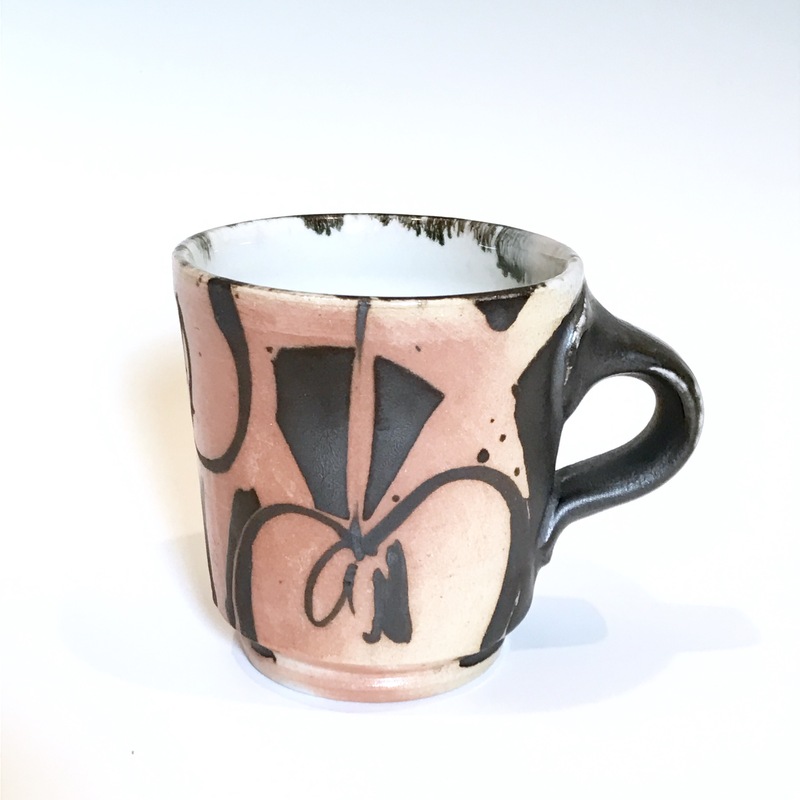 The underglaze pencil becomes a little blurry under the glaze. No visible crazing. a slightly glossy stoney matte glaze. Good translucency and seems to crackle where thick like in the crevices and corners of the tile. Very stable and shows all applications. Moderately glossy glaze with some satin tendencies on the second application. 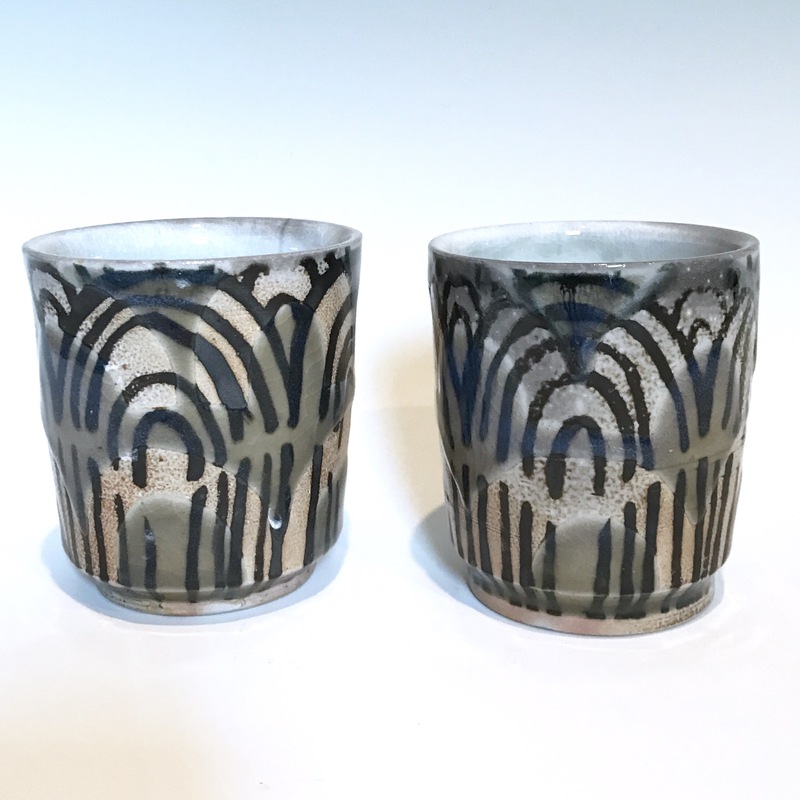 Glaze has good transparency and seems very stable. No signs of crazing. Very nice semi-gloss satin glaze with good fit (no crazing). Seems very stable and shows seem between first and second applications. Has good transparency and breaks over sharp edges well. Very glossy with the thin application and a good amount of magnesium crystal development on second application. Underglaze pencil has a little bit of blurring but is well defined (good transparency). 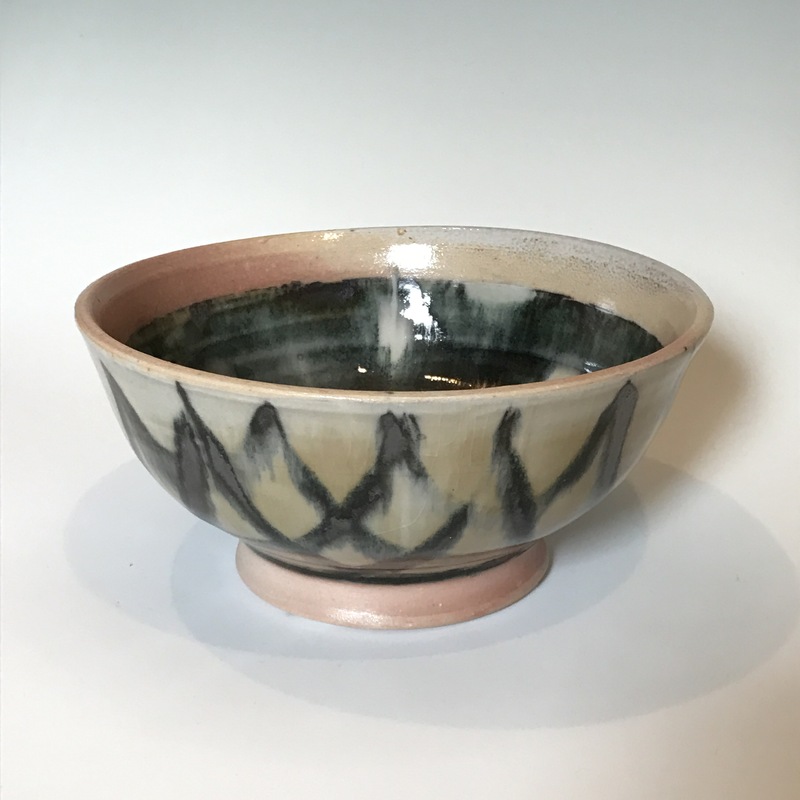 Good glaze fit with no visible crazing. Glossy grey clear with good translucency. 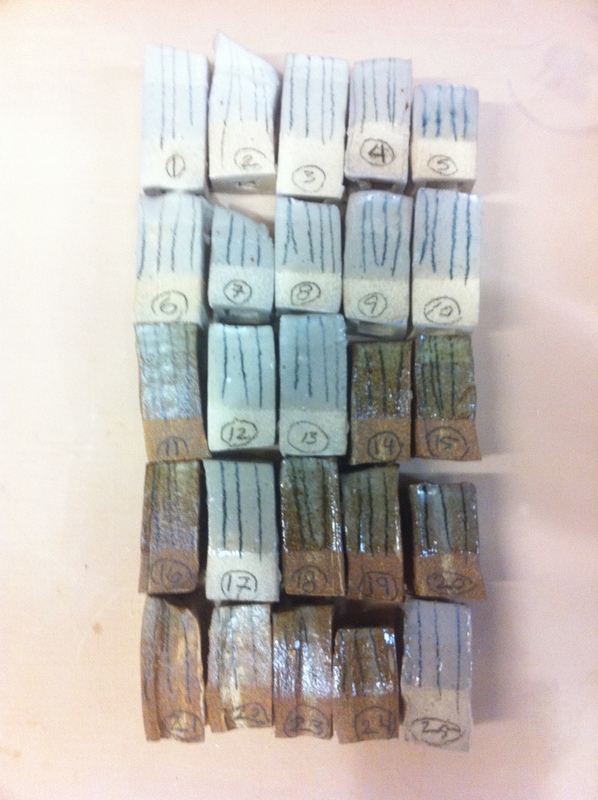 First and second dips almost completely blended together during firing. The second application area has some matteness and slightly decreased transparency. 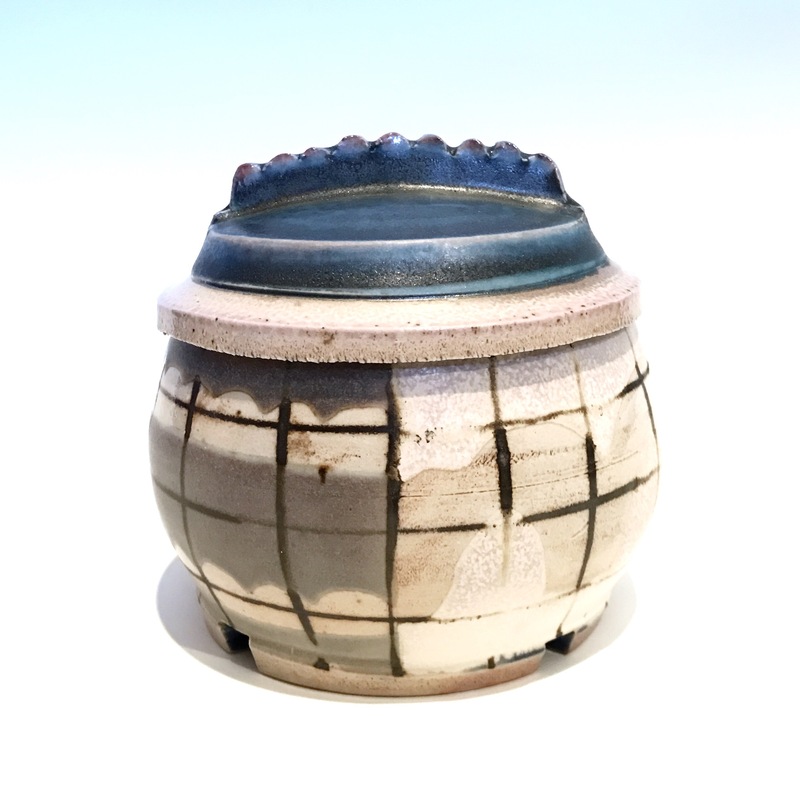 Glaze seems to pool and break well in textured areas. No signs of crazing or glaze defects. First application of glaze provides a satin sheen on the tile but shows all grog and clay texture. The second application is a creamy semi-transparent satin white. 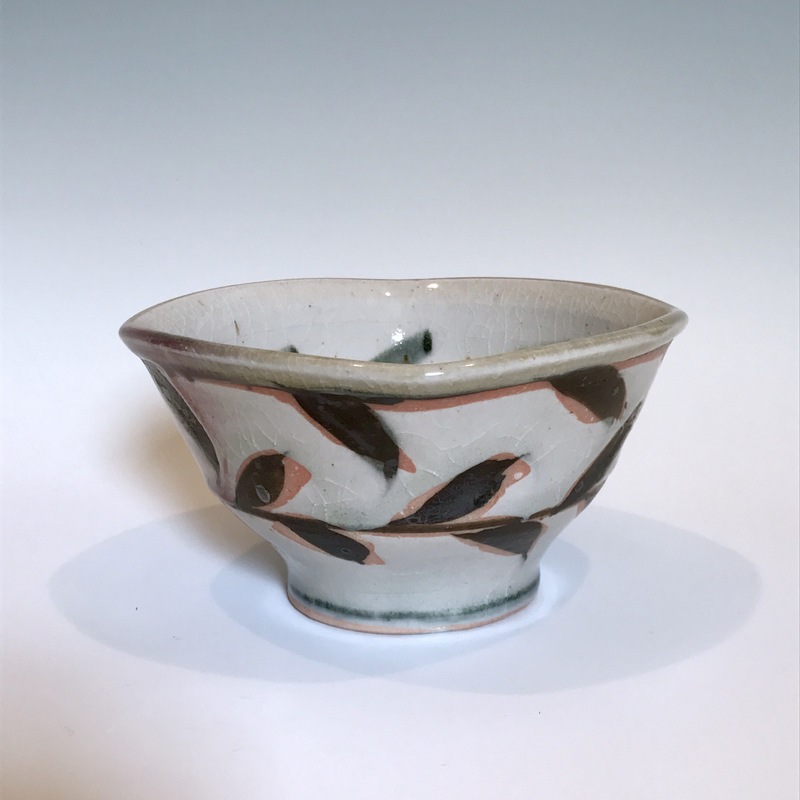 The glaze breaks well over edges and textured areas to reveal claybody and shows no signs of glaze defects. 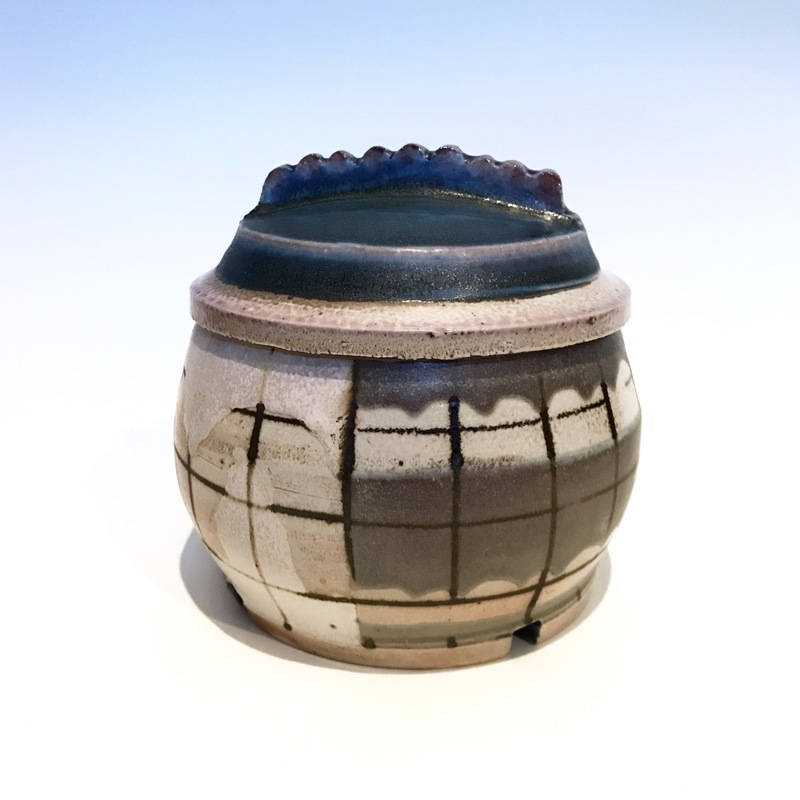 Very strong stable glaze thats nice and transparent. Glaze is semi-gloss on first dip transitioning to satin where application is thicker. 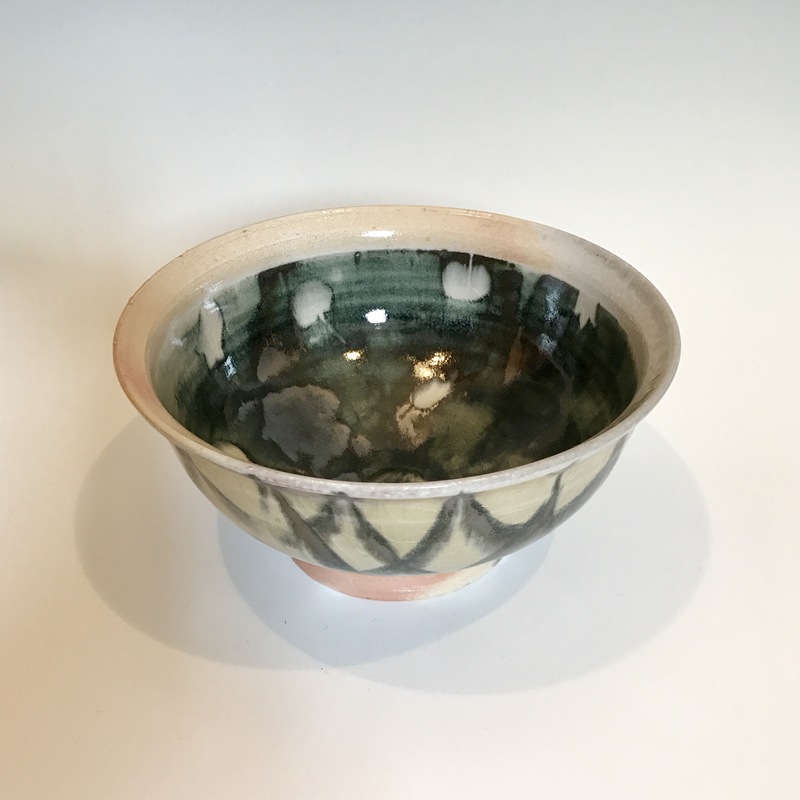 The glaze seems very stable but doesn’t show second and first dip transition as much as others, there is still a line. No crazing or glaze defects evident. This would make potentially make a good functional glaze. Glaze pencil seems brighter under this glaze. This tile is a semi-gloss satin glaze that seems to be very stable. There is medium transparency with a slight decrease on second application. The second application has a slightly increased magnesium matte quality. No glaze defects evident. Shiny glossy glaze with good transparency. 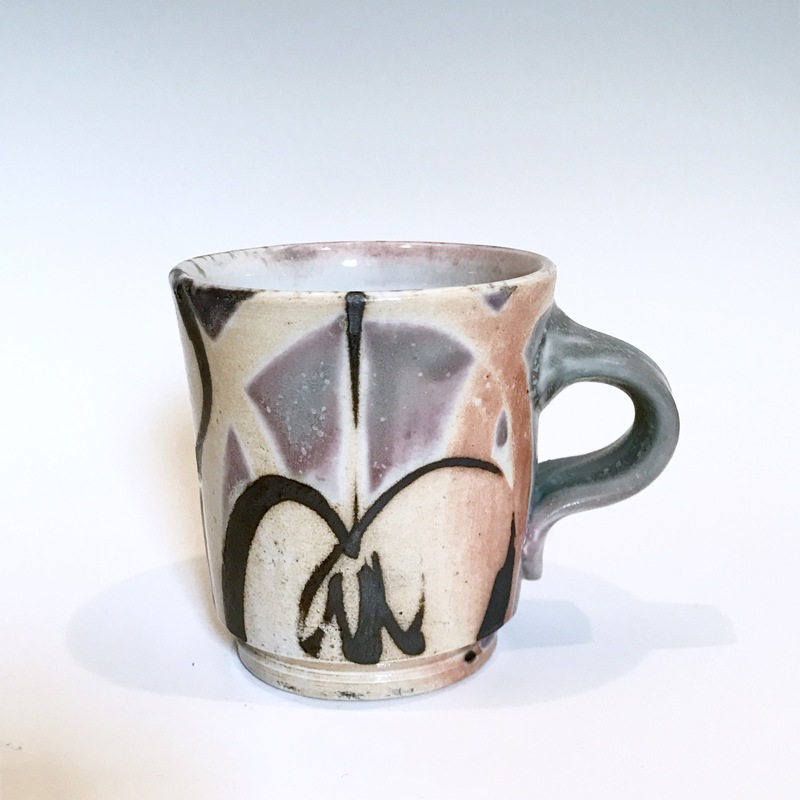 Underglaze pencil has a little bit of blurring and some dispersion in the glaze. Second application is slightly less transparent and hides the clay body a little bit. The glaze also seems to break well over the edges of the tile and has a little bit of effect from the magnesium in the talc. 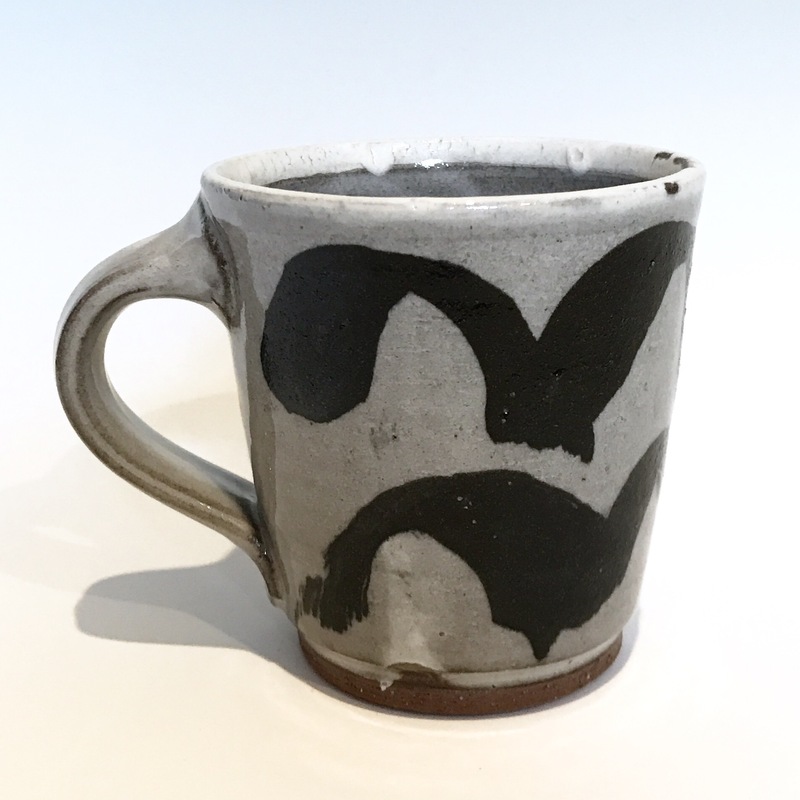 Very stable with no evident glaze defects. Very shiny and glossy glaze with some magnesium effects on the second dip. 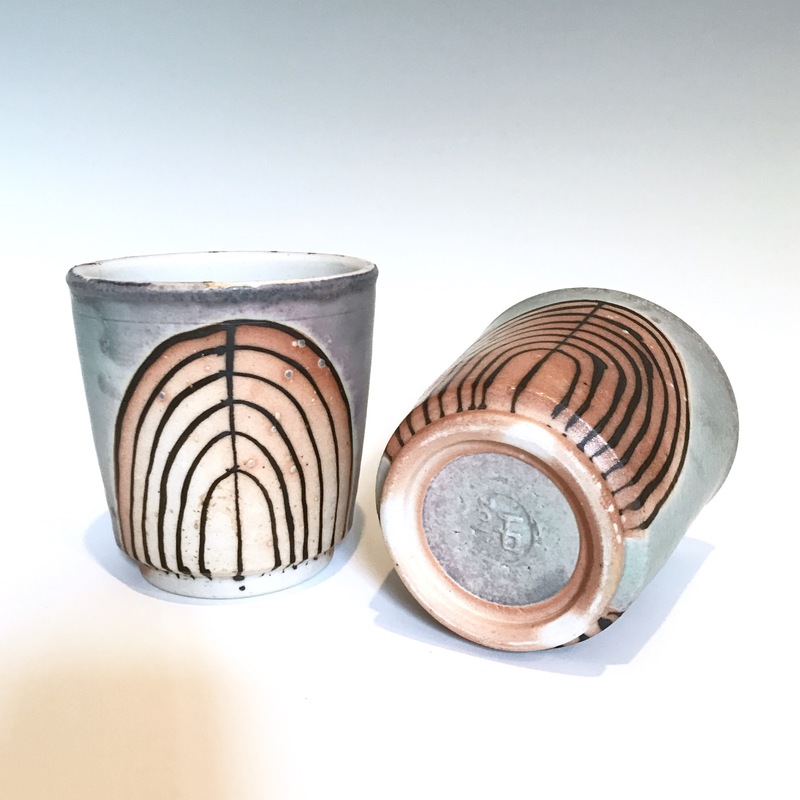 The glaze has medium transparency on second dip mainly due to magnesium crystals. Underglaze pencil has some blurring but still looks good. Glaze breaks well over edges and seems very stable. Satin glaze with moderate opacity. First application might make a good thin wash depending on colorant response and is slightly glossier than the second dip. The second dip is more stain and more opaque but seems to break well over edges of tile. Seems to be very stable. Very nice gloss on first dip and satin on second dip. More satin where thick and seems to thin out over edges and get glossier at those points. The underglaze pencil is very stable under this glaze. Doesn’t seem to be substantially grey like some clears. No glaze defects evident and could have lots of potential. Very glossy on first dip with a subtle transition to satiny-gloss on second dip. 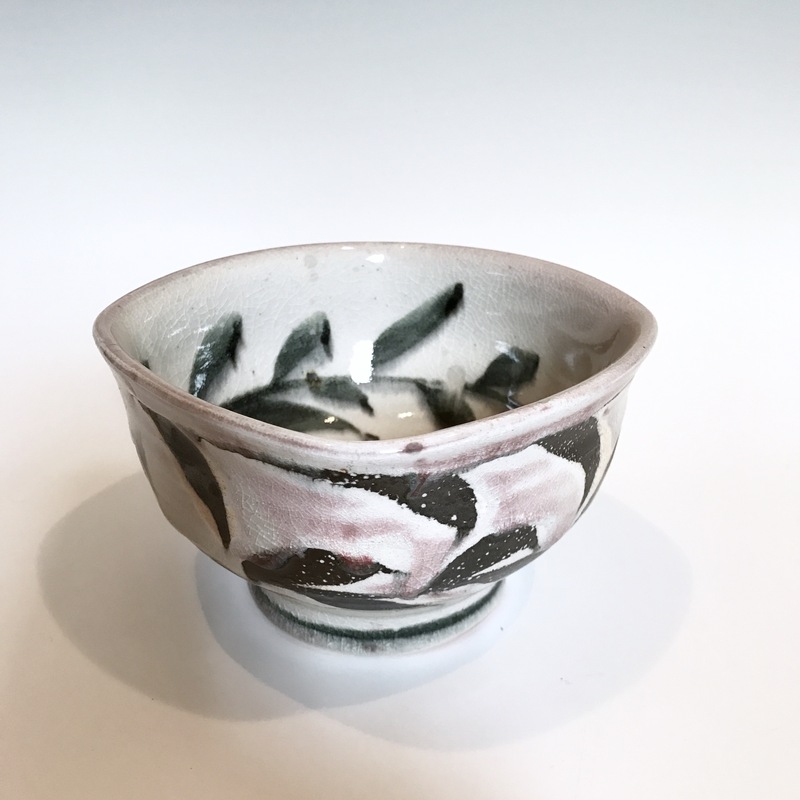 The underglaze pencil is very stable under this glaze which has a good translucency. 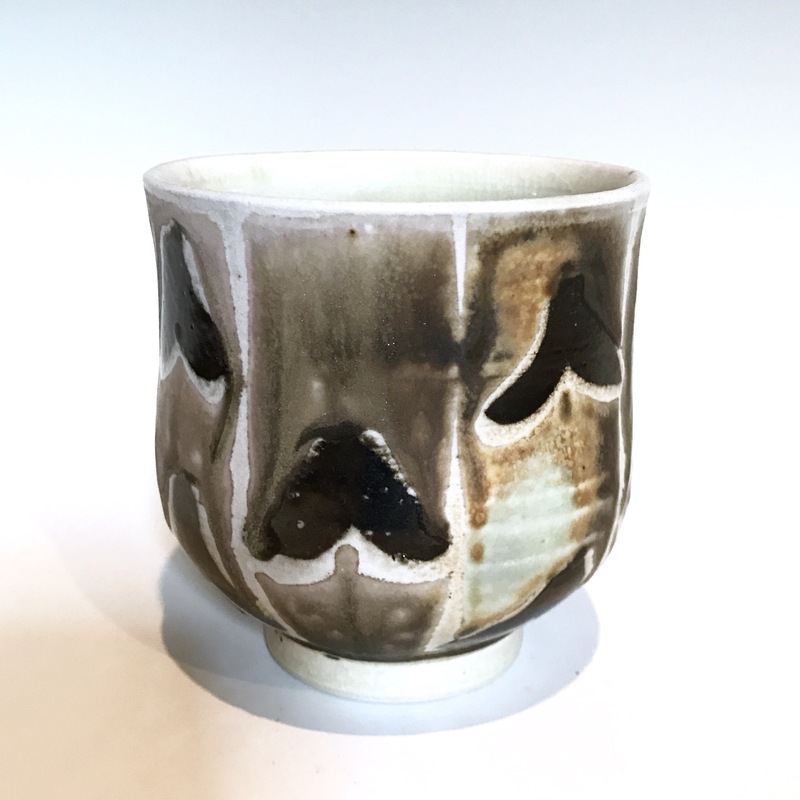 Seems to break well over edges and shows no glaze defects. Very glossy on first dip with a subtle transition to satiny-gloss on second dip. Slightly more glossy than tile 18. 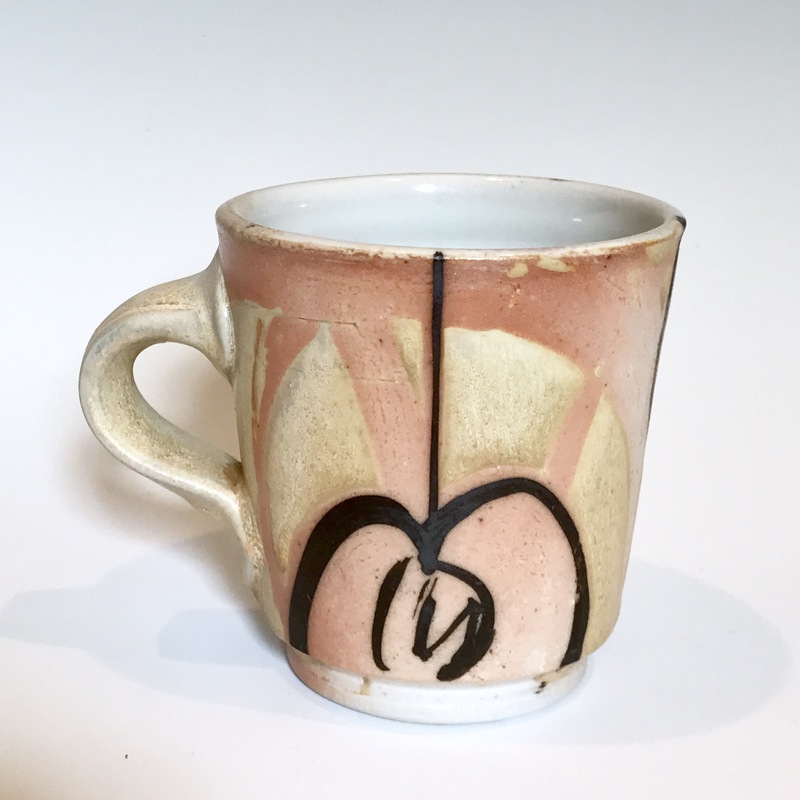 The underglaze pencil is very stable under this glaze which has a good translucency. Seems to break well over edges and shows no glaze defects. Very good glaze could have lots of potential. Very nice clear glossy glaze with some slight magnesium effect where thicker. The underglaze pencil has some blurring but its still pretty crisp. No difference in first and second dip. Breaks well over edges. 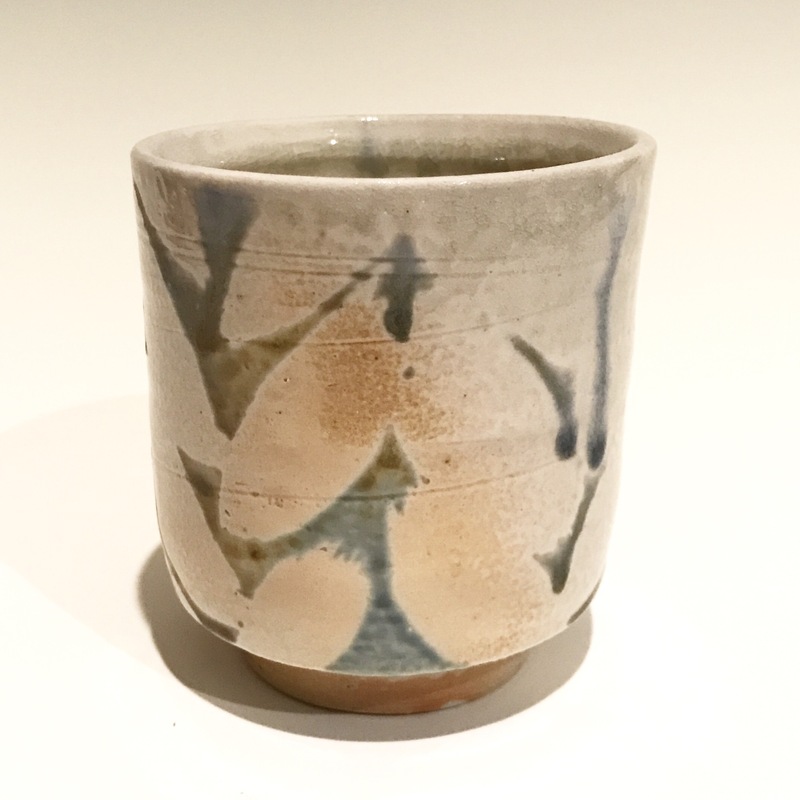 Very strong surface with no evident glaze defects. First dip gives a sheen and some gloss to the surface but doesn’t have any thickness. The second application is a matte glaze with some sheen that holds tight to the tile showing all surface texture. Could be used as a wash. Further testing needed. The first dip gives a glossy sheen to the tile and second dip is a semi-translucent dry satin-matte with gray and white tones. Very stable and shows all application particulars. First dip is a satiny sheen on the tile and second dip is a nice stain glaze with a good light gloss to it. 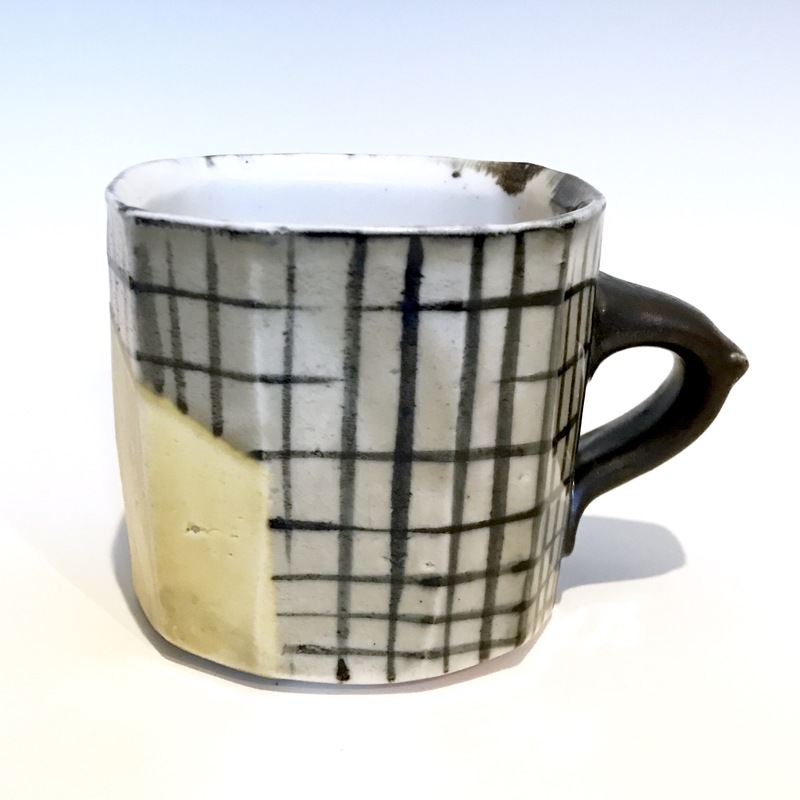 the underglaze pencil shows very well under the glaze. The glaze breaks well over the edges of the tile and maintains a satin quality around the edge. Has some milky feldspar qualities where thick. No evidence of glaze defects. Very glossy glaze on both first and second dip. The first dip shows the claybody very well and second dip is a bit whiter with some grey and green tones. Breaks well over the edges of the tile and has no evidence of any defects. Could have a lot of potential but may settle and require some suspension agent. Very shiny glossy glaze with strong surface. 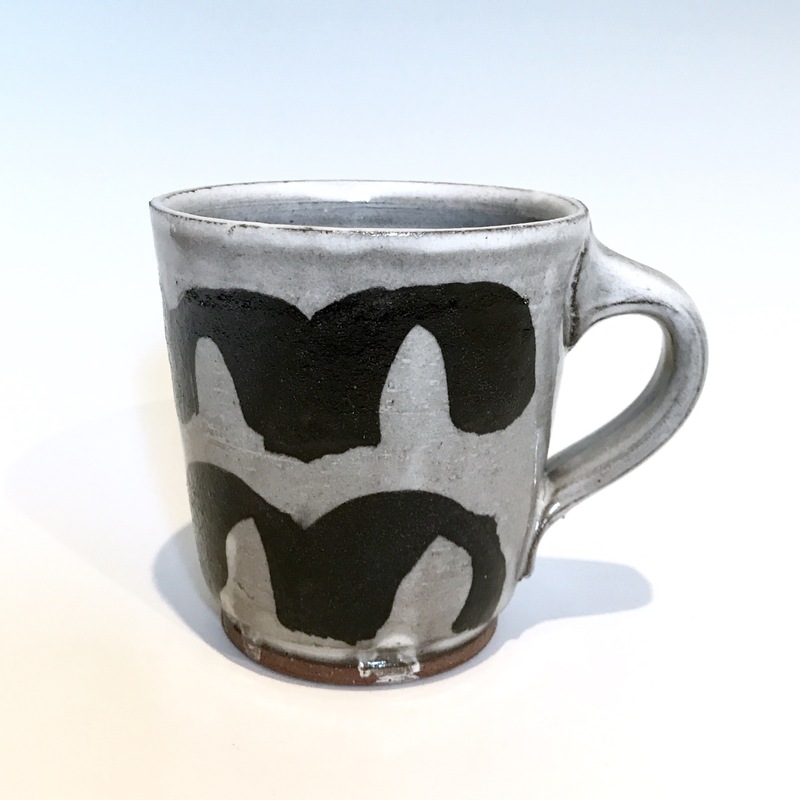 Glaze has nice transparency and doesn’t disturb the underglaze pencil. 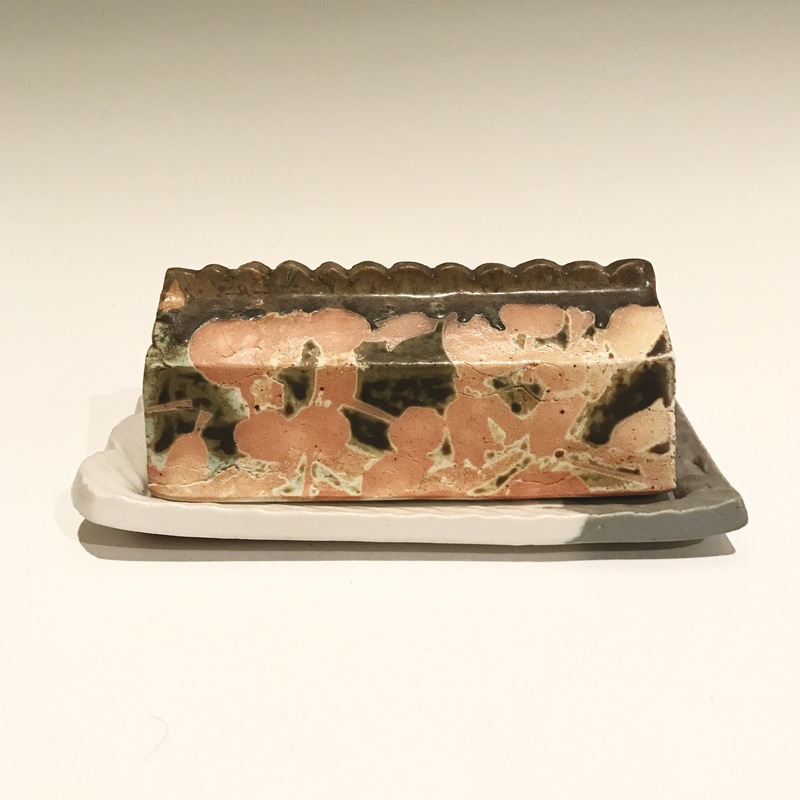 Very stable and first and second applications with smooth transition and no big differences in glaze effects for the two applications. Breaks well over edges and pools in texture well. No signs of any defects or crazing. 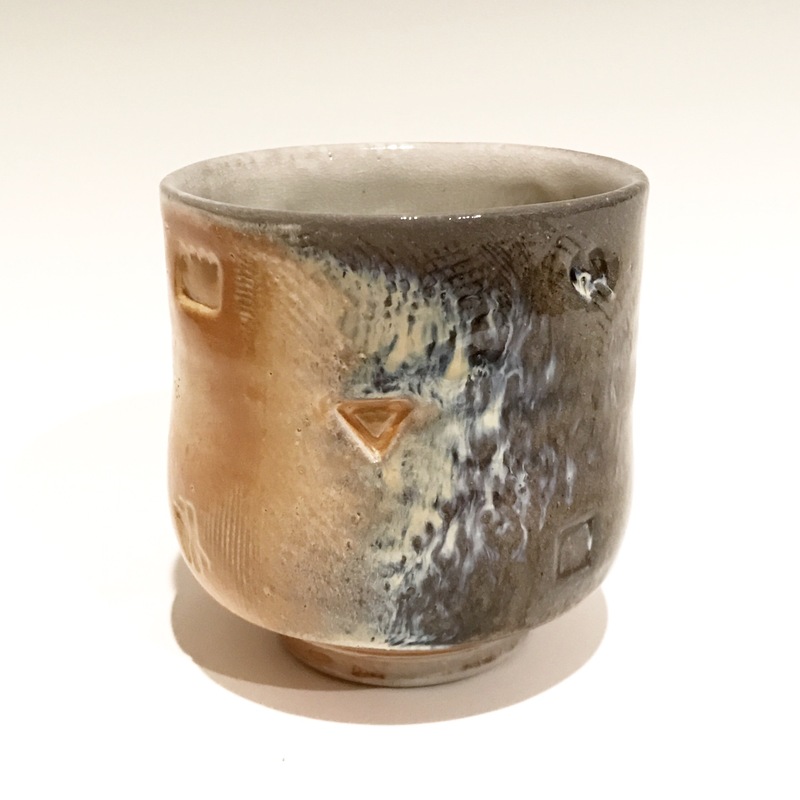 Because of the high feldspar content this glaze could require a suspension agent to keep it from settling in the bucket. I wrapped up my residency at Arrowmont at the end of May and took a job as the Studio Manager/Director of Santa Fe Clay in Santa New Mexico. By the time I arrived in Santa Fe the Santa Fe Clay summer workshops were in full swing. Its been a pretty fantastic experience so far. I’ve had the opportunity to work with many notable artists last summer and am excited about this coming summer as well. I am very pleased to have been given so many curatorial opportunities at SFC and have assisted in curating a number of shows here over the last few months. Recently me and our gallery assistant, Natasha Ribeiro, co-curated 6 Under 36 which opens this Friday and is receiving some press both locally and from Ceramics Monthly. The artists included in the show are Emily Duke, Linda Lopez, Brooks Oliver, Peter Pincus, Adam Shiverdecker & Matt Ziemke. I will try to write more about the show as I live with the work once its installed. The basic premise of the show was to bring in younger ceramic artists whose work both Natasha and I found fresh and exciting. Once I found a place in Santa Fe I was able to set up a studio and start working. While progress has been slow I’ve been able to get some work made. We recently finished a new soda kiln at Santa Fe Clay and did our first firing before the holidays. It feels good to know that I can soda fire my work once again. I will be documenting that work this week and hopefully sending it off to galleries shortly. I am also in the process of getting a new website up. I started playing around with square space in November and then had my computer stolen and lost all of my images and portfolios. So I’ve been hunting down some of my higher resolution images from applications and residencies and am now ready to start the switch over to the new page. 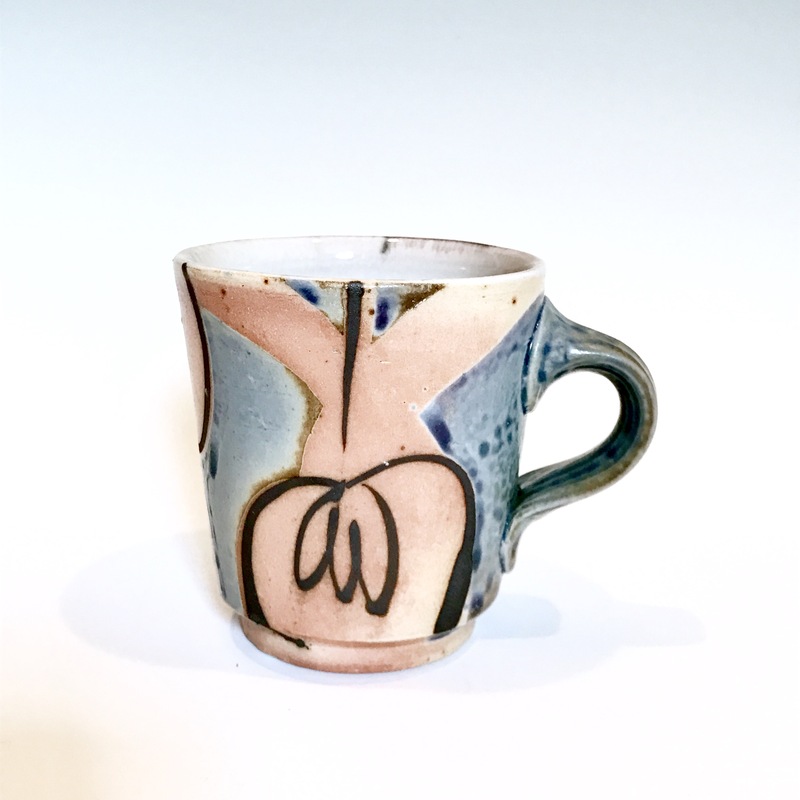 When I arrived in Santa Fe I didnt have a studio to work in for the first 3 months and so I diverted my energies into glaze testing and have subsequently developed a whole new batch of glazes to add to my palate. I am excited to write about them, what I am looking for when testing, and how I evaluate the results for what I would like to turn into a article in the near future. I am loading and firing a soda kiln this weekend and have spent much of the week learning about decals. 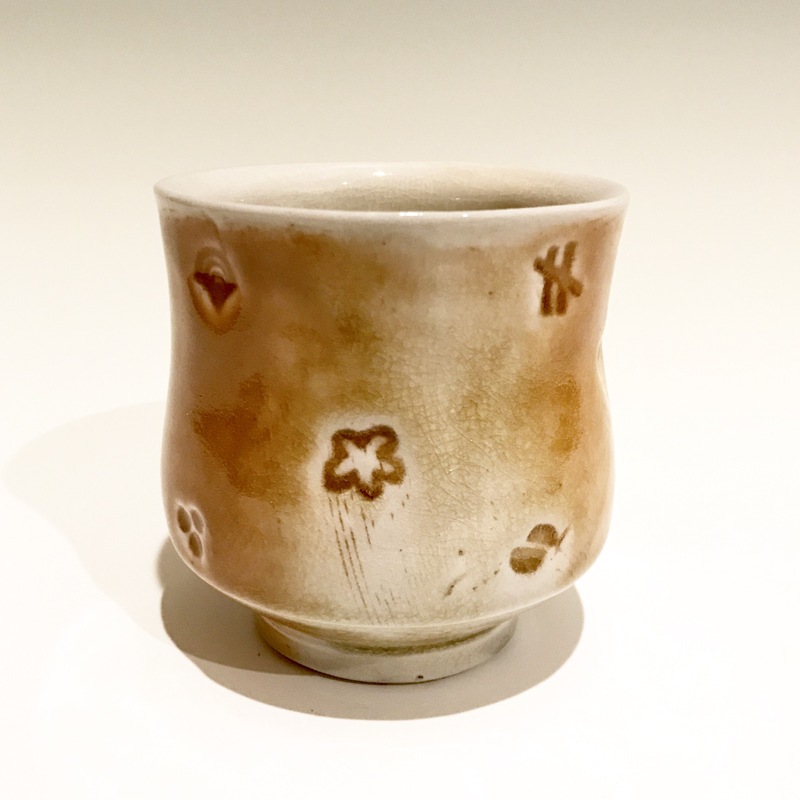 It was interesting watching Justin Rothshank work through his process and to see how he builds up his surfaces both before and after the firing. So now I ask myself “when is a pot done?” We talked about multiple decal firings and layering of glazes over decals or transfers to push the depth of surface even further. I am considering luster decals now. These images are me exploring and having fun. I think that a few of them were under-fired in the decal firing and didn’t thus some of the decals take as well. Since I use so many glazes they all have differing temperatures where they will accept the decal…so I will just have to turn up the heat on them. These were fun I hope you enjoy them as much as I enjoyed making them and remember these were explorations and one of them was me seeing what all i could get one to one piece and how much layering I could do. Guess which one. I had a good firing. A little uneven top to bottom but not bad for the first time in this kiln. Here is a time lapse of the unload.Its nice to pull work from a soda kiln once again. I have been firing gas and electric since November of 2012 while I tore down and rebuilt the Carbondale Clay Centers soda kiln. Which I might add is a daunting task alone in the Colorado winter. Anyway, I am glad to have the soda surfaces back in my work. I am also excited to have added ta few new glazes to my palette for this firing. So here is a short clip of me wadding pots and putting in the bottom shelf. This is the first soda firing I’ve done at Arrowmont. So far the kiln has been pretty easy to fire and adjust. I will be unloading on Wednesday and will do another video of the unloading. I am going to try to shoot a good number of the pots, if they turn out, before the A.I.R. open studios and post them before…but we will see how time is looking then. Shot this short video today while working on some juice cups. This is the first time I’ve done anything with a time lapse app… I think next time I will slow down the frames per second. Enjoy!